HOME - Welcome to Don Bosco Academy, Patna, India. 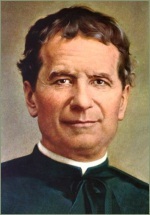 The Patron of this institution is - Saint John Bosco, or, as he is commonly called, "Don Bosco" (the Don meaning Father), was born at Becchi, a town in the foothills of the Italian Alps, on August 16, 1815. Losing his father when he was just 3 years old he grew up in abject poverty and had to face severe hardships and was unable to attend any regular school. As he grew up his own poverty and under privileged position made him increasingly identify with others like him. He decided to become a priest and was ordained as one in 1841. He then dedicated his entire life to the comfort , help, education and up-liftment of poor street urchins - whether in the streets, factories or prisons. John Bosco conceived the-: " Preventive System" of education". He died on 31st January 1888, and was canonized as a Saint on 1st April 1934. His first years of study were filled with difficulties which include supporting himself while attending school. He overcame this problem by working at various trades, all of which he later taught his students. Check for 2019-2020- Latest News. at :- State Bank Collect ONLY. © 2019 Welcome to Don Bosco Academy, Patna, India.